Solar energy is becoming more and more a part of everyday life and SwissINSO Holding Inc. (OTC PINK: SWHN), a company whose product, Kromatix™, pretty much revolutionizes the current trade-off between aesthetics, energy efficiency and cost. The Company’s glass applied to solar panels of all shapes and sizes allows for solar solutions to be completely integrated in to the architectural design of all types of building. With the sneaky little jumps SWHN stock has been making, the 10-K filed last month offers a preview of what is due to come. SwissINSO, in conjunction with the Solar Energy and Building Physics Laboratory of the Swiss Polytechnic Institute of Lausanne, Switzerland, targets, develops and commercializes breakthrough renewable energy green technologies by utilizing their intellectual property assets to provide aesthetic and efficient solar energy solutions and products to the renewable energy market. With a goal of becoming a global leader in the sector, the Company moved ahead last year by scaling up the production of its Kromatix™ colored glass with a full scale product launch planned for the last quarter of this year. Kromatix™ enables the production of glass in a multiple of spectacular colors for use in the production of solar panels and roof tiles. By replacing the transparent glass used in solar panel and tile production, the product provides for the end result to be stunning panels and tiles without any efficiency loss. Considering how Europe has always had a leg up on architectural designs, architects and property developers will be able to install these panels on building façades or the complete area of a roof due to the aesthetic nature of them. In April, Chairman and CEO, Rafic Hanbali, issued an update to shareholders in regards to the progress of its operations and outlook for the coming year which touched on the Company’s plans to showcase the Kromatix™ technology and how the first revenues are expected to come in during the 4th quarter of 2015. Understanding how the revenues will be dependent on renovations and new construction, the move forward to ringing the cash register should help to decrease the already restructured debt and boost confidence in long-term shareholders. Like with most development stage companies awaiting their revenues stream to start flowing, SwissINSO has been staying afloat thanks to related party loans and some small private sales. Operating expenses for the years ended December 31, 2014 and 2013 were just $1,434,999 and $1,490,694, respectively, which indicates a true realism of what’s happening over their in Ricolla land. 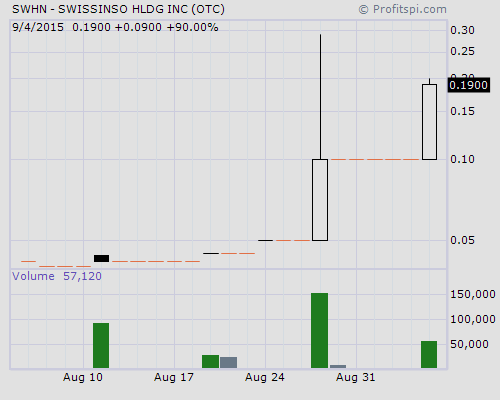 As of December 31, 2014, there were 143,625,892 shares of SWHN stock issued and outstanding of which 66,464,488 were held by insiders of the Company. Based on the current 200,000,000 authorized, the spontaneous jumps of the share price indicate that toxic dilution is not a concern, especially when you see that, during 2014, the Company sold 100,000 shares of SWHN stock to an individual at a price of $0.48 per share. Considering how SWHN doesn’t yet have a chart on the ever-popular StockCharts, it can be consider a “below the radar” ticker for now. Seeing as how the shares were able to jump 0.09 (90%) to 0.19 Friday on volume of just $8,565, 57,100 shares traded, a fast mover is one thing, but who will be there to buy what you bought is another.